How about building a scarecrow display featuring your favourite TV show characters? 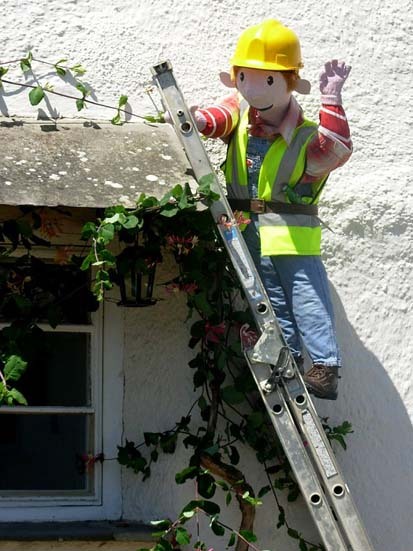 John Kerry sent in this photo of an excellent 'Bob the Builder' scarecrow display that was in the Village Competition at Bratton Clovelly in Devon, UK. John says Bob speaks for himself - well he would if he could! Here is a cute scarecrow based on the cartoon character, Sylvester Cat. It is called 'Sylvester Square Crow'! 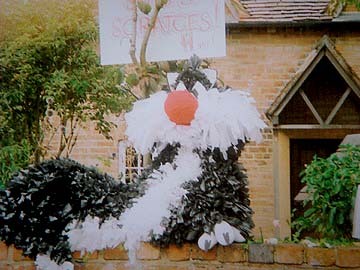 This great display was created out of wire and bin bags in 2011 by Pauline Luget Owen of Feckenham, Worcestershire UK. 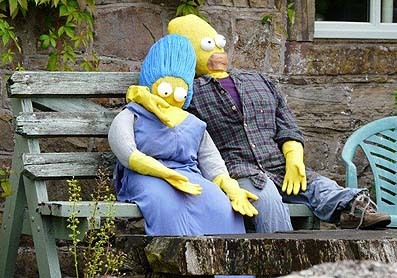 Here is a very cleverly made scarecrow display showing Homer and Marge Simpson from the TV show, The Simpsons. It was built by Jean & John Simpson of Farlam Parish in UK. Photograph courtesy of Hugh Beesely. 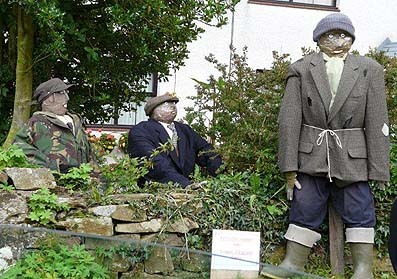 And here is another creative scarecrow display showing characters from the TV show, Last of the Summer Wine. It was built by Robert and Gwen James of Farlam Parish in UK. Photograph courtesy of Hugh Beesely. 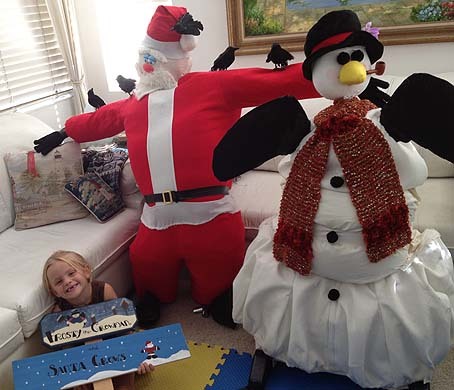 Teachers Mary Gregory, Beckie Peterson and Andrea Gregory and the preschoolers of Mary Gregory's Schoolhouse Family Day Care Centre at Valencia in California, USA made this wonderful scarecrow display in 2012 based on the popular old Christmas song, 'Frosty the Snowman'. What a funny and colourful tribute to the Christmas season! The scarecrow ideas for the following three Scarecrows in Motion displays all came from well loved old songs. In each case a sound track of the music was played as part of an animated scarecrow show. Click on the links to see more photographs and details. The Bicycle Built for Two scarecrow display was based on the old music hall song, Daisy Bell. 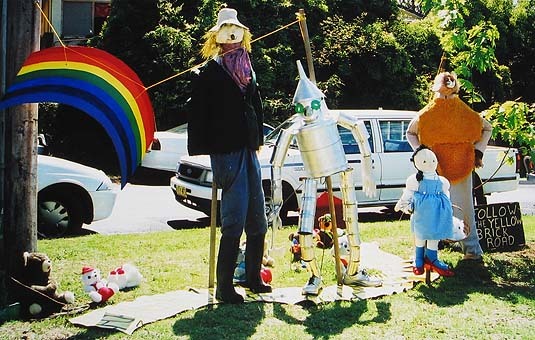 The Strawy Matilda scarecrow display was based on the famous Australian song, Waltzing Matilda. 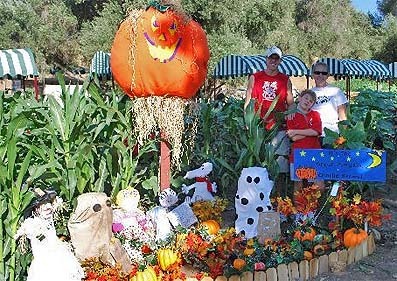 The Old MacStrawy Had a Farm scarecrow display was based on the popular children's song, Old MacDonald Had a Farm. 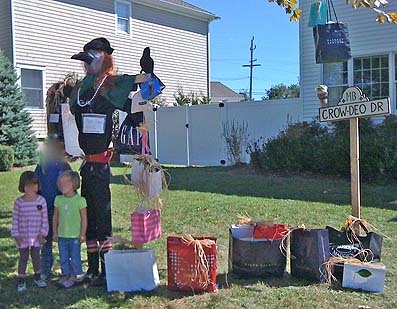 This funny and colorful scarecrow display was called Shop-Crow-Holic, based on the book and movie. It was made by Jennifer Azzolini and her family for their local Scarecrow Festival. 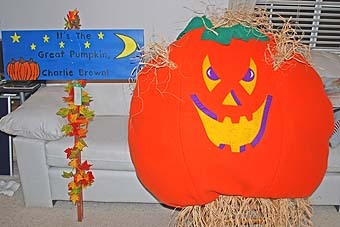 This excellent scarecrow idea was based on the movie, The Wizard of Oz. It featured a scarecrow lion, scarecrow tinman, and scarecrows of Dorothy, Toto and The Scarecrow, all walking along a Yellow Brick Road. 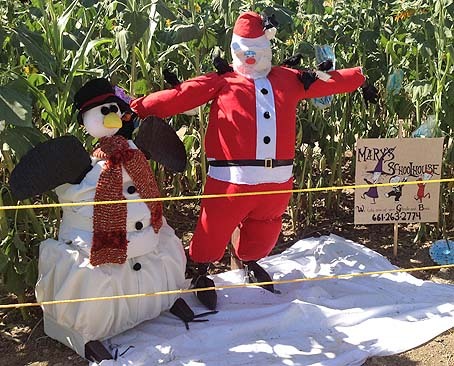 These wonderful scarecrows were made by teachers, Beckie Warloe, Breanne Crane and Mary Gregory, and the children of Mary's Schoolhouse AKA Gregory Family Child Care at Lombardi's Ranch in Santa Clarita Valley, California. 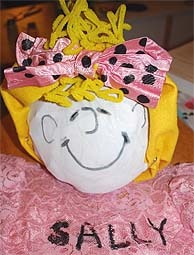 Note: This page includes scarecrow ideas for you and your kids to make based on favourite songs and movies. 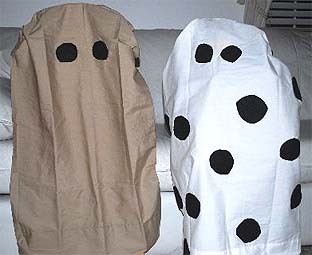 You could set your scarecrow making skills towards making a scarecrow Shrek, a scarecrow Harry Potter or a scarecrow Mary Poppins.